Sitting in the departure lounge at Cairns Airport waiting out a two hour delay in our flight to Japan is probably not the best time or place to be writing this prologue, especially since we had to get up at 4am to make the connecting flight ....... but, there are two hours more to wait and not much else to do. We are about to head off for five weeks of exploration in The Land of the Rising Sun, not enough time to do these rich and diverse island justice, but a good sampler nonetheless. We have timed our trip for Cherry Blossom Season to complete one more item on our bucket list. That said, the trip will revolve largely around walking, with a six-day bike ride thrown in for variety. Our plan was to start with a warm up hike near Hiroshima, on a small offshore island famed for its cultural history as well as its landscapes. Then, a quick trip by bullet train would take us to the island of Kyushu for our "Cherry Blossom and Onsen" bike ride - the idea of pedalling our way through the Japanese coast and countryside, beneath the falling petals was very enticing and the possibility of a soak in a hot spring at the end of each day's ride nailed it. However, the flowering of the cherry tree is very ephemeral, lasting only a week, and its timing dependent on seasonal conditions. Lets hope that the season is an average one, for that is when our ride is targeted. Leaving the ride, we hire a car and head into the mountains of Kyushu, to check out the volcanic landscapes that formed much of this island - a visit to the Takachiho Gorge and a two-day walk in the mountains of Kuju being our main objectives. From Kyushu, we will speed back to the main island of Honshu by bullet train, heading for the Kyoto-Nara region to hopefully catch the peak of the cherry-blossoms as the flowering season heads north. I searched long and wide for the best blossom sites - the ones where we would be sure of seeing cherries in bloom regardless of our timing. 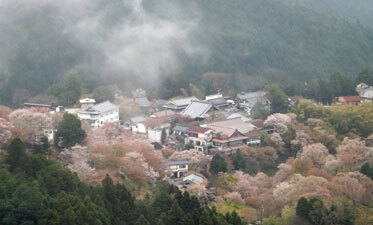 So, one of our visits there will be to Yoshinoyama, a mountain with 30,000 cherry trees planted on it. As the flowering season varies with altitude as well as latitude, somewhere on the mountain there should be trees in full bloom. A walk up its slopes will be a highlight, though I am sure that we won't be alone - the Japanese love their cherry blossoms. Accommodation in the Kyoto area is very hard to get at this time of year. 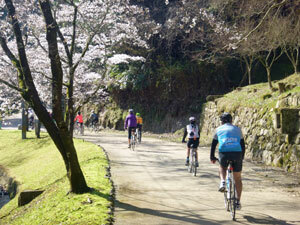 I suspect that we may be blossomed out by the time we leave Nara. However, we will be heading to another trip highlight - a 7-day walk along one of the routes of the Kumano Kodo Pilgrim Path. This network of trails across the Kii Peninsula, wandering from inn to inn has been a route for Buddhist pilgrims for 1200 years. 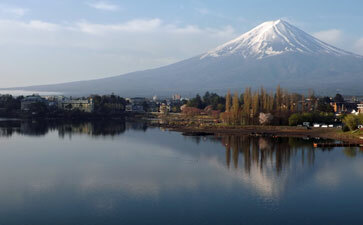 From an ancient pilgrim locality to a more recent one - we head from the Kyoto area to Fuji Five Lakes for a last few days on the northern slope of the famous Fujiyama. I have long wanted to see this mountain and from here it is apparently quite spectacular. I have also wanted to climb it, but in the early spring of cherry blossom time this is not possible, as the upper slopes are still covered in snow and ice. Sadly, this is the case for all of the Japanese Alps, so the walking tracks in these areas will have to wait for another time. It is good to have an excuse to return. The PA has begun to announce our boarding call (at last), so we are finally off to Osaka and the start of our adventure - sayonara Australia, konichi-wa Japan. I was wrong - the announcement as we waited at Cairns Airport was not telling us to board, but that there would be a 4 hour delay before departure, due to "engineering issues" with the plane. As the time approached, this delay was extended to six, then eight, then 11 hours. There is no place more boring than an airport lounge with over 300 people sitting around waiting for some news .... the air of ennui seems to seep from their pores and make the air heavy. Still, the next announcement was enough to shock every one back to reality - "Flight cancelled!" We all trudged back to retrieve baggage, re-enter the country through customs and then queue for a couple more hours in order for Jetstar to find us all another way to get to Japan. A few lucky ones got a direct flight the next day, many were able to fly directly but two days later (which is small consolation if you are going for a week's skiing in Niseiko, as many were). We, along with others, were re-routed. After an overnight stay in Cairns, we were flown back to Melbourne (back-tracking 2500 km on our preferred direction of north) in order to catch the evening flight from Melbourne to Narita Airport in Tokyo. This would cost us the first two days in Japan and necessitated booking a new flight from Narita to Kumamoto with Jetstar to catch up with the start of our bike ride. It was a nuisance and a costly one, as Jetstar charged us the additional fare of the re-routed flights, but at least we wouldn't lose too much time. Alas ... if only that were true. We arrived in Melbourne to be greeted by the news that "due to engineering issues" the flight had been delayed until the following morning! So, another shuttle trip to another airport hotel for all the passengers to waste away another day and night. The bonus to all this, was that we now wouldn't reach Narita in time to connect with the ongoing domestic flight to Kumamoto, so that too had to be re-booked. But don't worry, said Jetstar, we will put you up in an airport hotel near Narita for the night. Well, counter to everyone's expectations, after a 5am rise, we actually left Melbourne on time (the 10-hour delayed time that is) and the flight was uneventful. The only problem was that Jetstar in Australia hadn't told their office in Narita that a sizeable number of passengers had been promised airport accommodation. This led to a few "issues' at the service desk, but, in the end, we found ourselves at yet another airport hotel on Jetstars tab (don't laugh, Qantas shareholders, this will cost you all at dividend time). We were finally in Japan - what should have been a simple 14-hour transit, had turned into an 80-hour comedy of errors (though by the end no one was laughing anymore). Not only did Jetstar charge us more for this privilege, but, to add insult to injury, they included a booking fee for doing so.